Please note that due to lack of premeditated pimp planning the frying pan in the shot was totally abandoned for a strange plastic container thing which could only have been designed for pimping snacks. Watch out for it later on. You’ll be impressed. 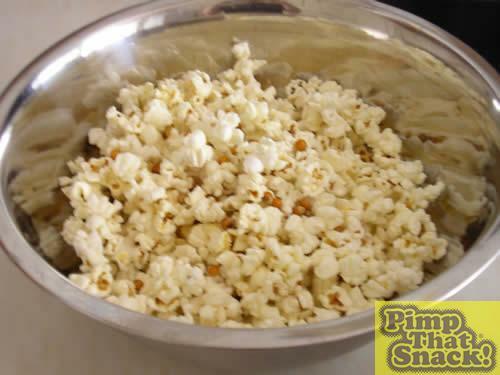 Now we all know that Snack-A-Jacks are made from polystyrene, which is the main reason this snack requires a good pimping, and also only has half a calorie per coaster – so, for taste based necessity, popcorn was used as the basic building block for this snacky upgrade. Still only half a calorie, obviously. 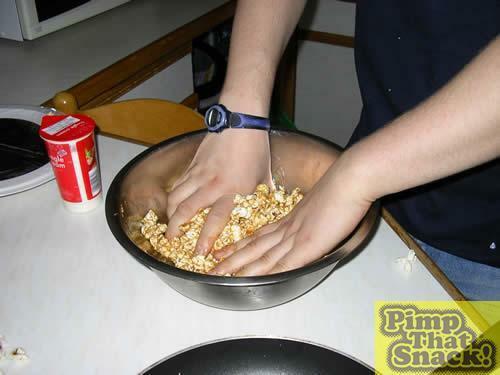 Please acknowledge the amazing quality of the ‘pouring the popcorn’ action shot. It’s all going on here! Hmmm. There appears to be an awful lot of unpopped kernels in the mighty mixing bowl.14 hours later we have carefully extracted the legitimate popcorn from it’s unworthy brethren. This bowl of wasted, unfulfilled, sanctimonious (possibly) rabble of the damned was cast into the fiery pits of Nextdoor Neighbours Barbeque for later, minor explosive, comedic value. 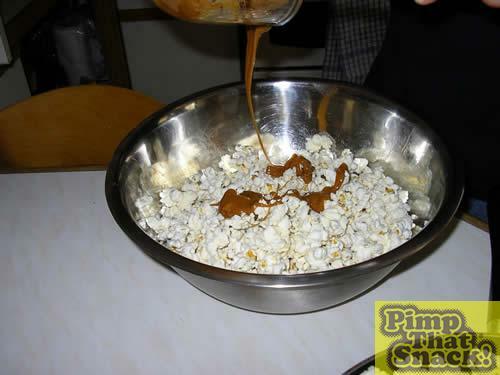 Next pour on the recently nukeowaved bag of dairy toffees… perhaps the addition of some cream would have a positive effect on the general consistency of the bowl of gunge… that’s it! We have No More Nails limited ‘Toffee Edition’. Now, how are we to bind these new bedfellows? Umm… Ahhh… What if we… Frelk it, I’ll stick my hands in it.